The Loop is full of architecture that represents the pinnacle of works designed to offer new visions of the future written in stone, steel, glass, masonry, and other materials. 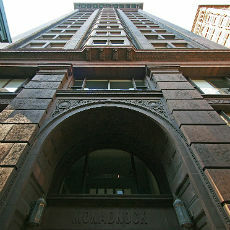 This tour will take visitors around to some of the key sites (including Daley Plaza and the Monadnock Building) that offer some of Chicago’s most compelling moments from the past century or so. This tour is led by urbanologist Max Grinnell. Rain or shine!